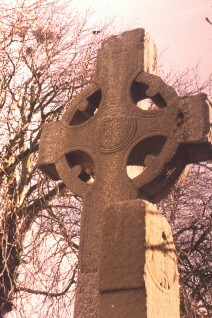 This is a close up of the east face of the cross head of the North Cross, Monasterboice. MacAlister, R. A. S., , ‘The Panel representing the Traditio Evangelli on the Cross of Muiredach at Monasterboice’. In Journal of the Royal Society of Antiquaries of Ireland (1932) 62, 15-18.